Pinkadots Elementary : Saturday Spark Student Motivation: Writing and Singing Songs with the Class: Freebie! Saturday Spark Student Motivation: Writing and Singing Songs with the Class: Freebie! Hello Everyone! Today, I am linking up with the always amazing, Joanne, from Head Over Heels for Teaching for Spark Students Motivation Saturday. A few years ago I started a tradition of writing songs with my class when learning new material. I realized my class was a bunch of right-brain students and luckily I was more of a right-brain teacher myself. If you want to know what type of teacher you are, check out this article from Scholastic, it explains it all. I know I am a right-brain teacher because teachers with right-brain strengths generally prefer to use hands-on activities over a lecture format. With the right-brain preference of seeing the whole picture, these teachers incorporate more art, manipulatives, visuals, and music into their lessons. They tend to embrace Howard Gardner's multiple intelligences. They like to assign more group projects and activities, and prefer a busy, active, noisy classroom environment. The classroom of a strong right-brain teacher will typically have materials and books scattered all over. We started with a fun topic, Junior Achievement. Does anyone teach a Junior Achievement program? We get parents volunteers and community members and now teach the whole program in ONE day. I actually like it. We call it JA in a day. I used this song to pre-teach my students, so they wouldn't be clueless and get more out of our JA day. Next, I wrote key words on the board and groups of students looked up definitions. When we had our research we (mostly me, but I led them to the ideas) started writing our song. 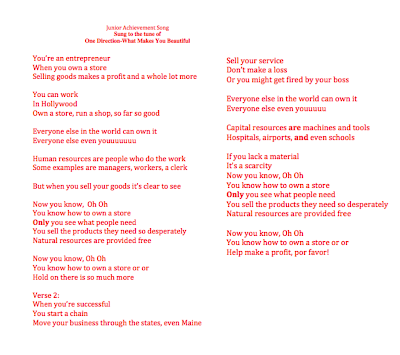 The fourth graders loved this so much, it went viral in the school and all the classrooms were learning and singing it. Some teachers wanted to kill me, but others loved the idea. Kids taught their friends on the bus, at after school activities, and I even received parent emails telling me if teaching doesn't work out I should go into song writing. hahaha The exciting part is that the students REALLY learned the material! If any of this fits in with your curriculum you are welcome to download the song for free by clicking on the above picture. If I can find my other songs from over the years, I will post them another day. I will be trying this soon with my new class. I had no idea I was a right brain teacher. I love it when I learn something new. Thanks for sharing, and for the freebie. I love this idea. I'm all about adding music to the classroom. Thank you! This is so fun!! I took the quiz and was fascinated that I came out as a "middle brain" teacher. Cool stuff! I'm anxious to go take that quiz now! I love One Direction probably as much as my kids! haha Did you see the multiplication properties song I linked up last Sunday to that tune? It's very catchy right? I love the idea of creating your own songs to learn material-so fun! I didn't know JA was still around-I wonder if our county still supports that program. The year I did it, my students really enjoyed it. Thanks for sharing and linking up Theresa!